Make an Origami Sailing Yacht! This super fun origami boat or yacht is very quick and easy to make. You can make several of these and race them together with your friends! This traditional origami yacht makes a great rainy day activity for kids from about 5 years of age. Use different coloured papers so that they know whose is whose! You could also decorate them with the child's names if you only have white paper. If you are using plain white printer paper, it's very easy to make it into a square. Simply follow these instructions. You can use any kind of paper for this, newspaper, construction paper, wrapping paper or whatever you have around. The great thing about these origami sailboats is that they really go! Just blow the sail from behind, making sure that they have a clear path on a smooth surface. You could also see if these would work in water. For ideas and advice on water-proofing you papercraft and origami, click here. These origami boats would also make a cute place card holder at a party, just write the guest's name on the sail. Start off with your square paper white side up, so that you end up with a white sail. The paper should be rotated so that it's a diamond shape. 1. Fold the paper in half from left to right and then unfold. This will give you a vertical central crease. 2. Fold the right and the left edges and align them to the central crease. 3. Fold the bottom corner up to the top corner and flatten it out. 4. This is the result that you should have now. Tip: Remember that the neater and crisper your folds are, the better your final origami model will turn out! Click here to check out some other helpful tips when folding origami with children. 5. Next, fold the right and the left edges in to align with the central crease. 6. Fold the top layer down, from as far down as is possible. 7. Curl the top point towards you using your finger or a round pencil. 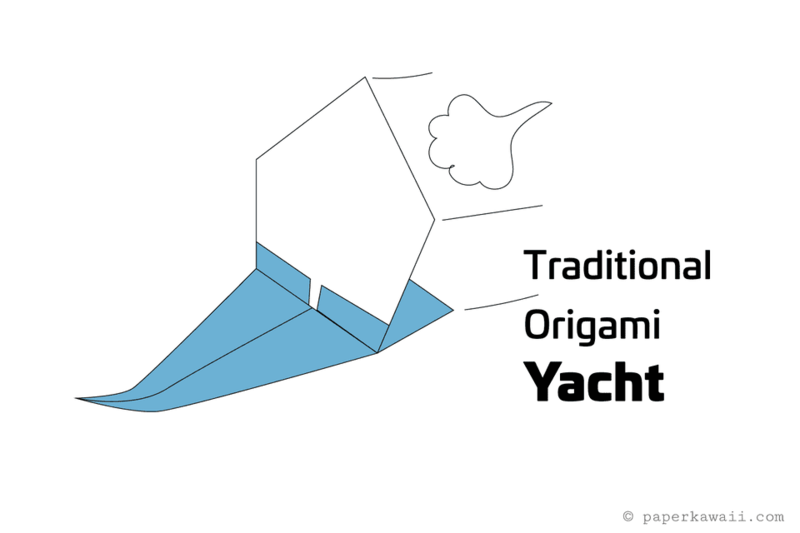 8 You can now fold your sail upright, and have a go at blowing your origami yacht! Try different curl amounts to see what works the best! Try placing a small toy on to the front of the yacht, just in front of the sail, does it still go? If you enjoyed this tutorial, check out the 'Origami For Kids' section here. If you love origami boats - why not try out the Easy Origami Boat, How to make an Origami Sail Boat or How to make a Traditional Origami Ship next! You could make all of them, and see which one goes the furthest in a stream or river.